Eee!! 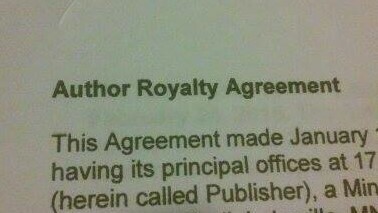 My First Author Royalty Contract!! Basically, it means that I will have a book out there with my name on the by-line, and for each book that is sold, I will get a percentage. And while other books have been published that I’ve contributed to (anthologies and books that I’ve ghost written), this is my first contract for a book that is all my own! In spring 2016, my book will be released by Capstone as part of their Tangled History series! So today, on National Holocaust Remembrance Day, I will be emailing my signed contract to my editor at Capstone (eee…I actually said, “my editor at Capstone!!”). And why do I mention that today is National Holocaust Remembrance Day? Because my book for this series happens to be about the Holocaust! I pray that I can do justice to such a heavy and important piece of history with my writing. As I put this book together, I will be using a Pinterest board to keep my research organized. So in a way, you can follow along with my research if ya’ want! Just click here, and follow “The Holocaust” board on my Pinterest page! I will allow myself a moment to happy-dance (which always includes a little “running-man” action and flailing arms – it’s ugly, and I’m sorta glad you can’t see it), and then I will buckle down and start putting together my outline (which is due to my editor in less than 4 weeks). And while it makes my heart heavy to research this topic, I am so honored to have been asked to write this book! And after you take a minute to happy-dance for me (if you’re so inclined), please take a few more minutes to remember the victims of the Holocaust, say a prayer for peace and then do something beautiful for someone today (even if it’s something as simple as giving someone a hug, or paying for the latte of the car behind you at Starbucks)…because when we remember the ugliness that can come from hate, we should do all we can to put the beauty of human kindness into our world.